Paul Manuel, the founder of Chacewater Winery & Olive Mill, is very familiar with the hard work and passion it takes to grow grapes and make wine. When he started the winery in 2008, he and his wife, Kellye, had already spent the last 20 years caring for the vineyard they had started after a devastating forest fire nearly destroyed his family's homeland in the Sierra Foothills. The family worked tirelessly, planting grapes to create one of Nevada County's first commercial vineyards. Paul sold the exceptional, organically grown fruit to Fetzer Vineyards until 2008, when he acquired a 10-acre olive mill property in Lake County from the monks of Saint Gregory of Sinai Monastery, and built a 10,000-square-foot winery. To honor his family's strong work ethic and endless determination, he chose the name Chacewater after his ancestors' town of origin, Chacewater, England. Paul hired two important consultants, winemaker Mark Burch and mill manager Emilio De La Cruz, to help with Chacewater Winery & Olive Mill. Mark has a longtime expertise with the grapes of Lake County and went straight to work, helping Paul craft exceptional wines that reflect the terroir of the Lake County region. The Chacewater portfolio has already received high praise. Six wines won awards at the Third Annual Lake County Wine awards. including the 2009 Red Hills Syrah, which won the Red Wine Sweepstakes. Chacewater also received Gold for its 2010 Sauvignon Blanc, Silver for its 2010 Chardonnay and 2010 Riesling, Bronze for its 2009 Malbec, and Best of Class for its 2008 "0-Eight Headache!" California red blend. Chacewater olive oils are continually lauded too. 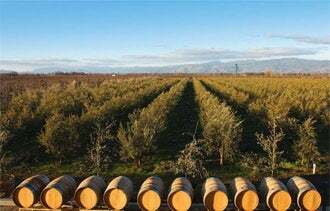 Eight varieties of olives grow in the orchard, and Chacewater uses the most advanced methods to produce the finest extra virgin olive oils, citrus-infused oil, and olive oil soap products. Emilio recently came on as full-time Mill Master to manage the growing business. As the awards roll in, so does the attention to Chacewater Winery & Olive Mill, and the magnificence of Lake County as a whole.